SIMPSON BAY, St. Maarten (February 16, 2014) - “Beneficial to all parties,” was how Prime Minister Sarah Wescot-Williams described the agreement she signed Thursday morning on behalf of government with the Princess Juliana International Airport operating company (PJIAE), which was represented by its managing director, Regina LaBega. The brief ceremony was held at the Public Fire Department in Cay Hill in front of a small gathering that included the Chairman of the Supervisory Board of Directors of PJIAE, Clarence Derby and other board members, as well as senior management staff of the company and Fire Chief Clive Richardson. The Prime Minister recalled how it was one year ago that SXM had submitted the letter requesting the transfer of the Public Fire Department at the airside of the airport. The decree authorizing the PM to sign this relocation and use agreement with SXM became effective only on February 4, 2014. 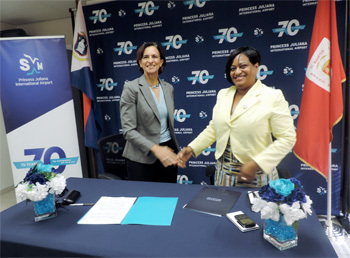 The agreement will allow SXM to demolish the existing airside public fire department building and start work on the construction of its new state of the art Fixed Base Operations (FBO) facility at the same location. In exchange for this, SXM will provide a temporary location for the public fire department at the Turtle Pier, construction of which is in progress and also offer a new rent-free landside substation for the public fire station. Moreover, PJIAE shall pay the rent of a storage space, which is to be used exclusively by Government and solely to store all materials and equipment currently stored at the present location of the public fire department for a period of 24 months. Furthermore, PJIAE will build a new facility, which will house on the airside the PJIAE Fire Station and on the landside a Substation for the Public Fire Station. Government will have the right of this substation free of charge. The substation will also be equipped to house St. Maarten’s ambulance as per the request of the Hon. Minister of Health, Cornelius De Weever. Minister De Weever had requested an ambulance outpost in the Simpson Bay area in order to provide timely responses for medical emergencies to residents and visitors in the Cole Bay, Simpson Bay, Airport, Maho, Mullet Bay and Cupecoy areas. In her brief remarks, LaBega expressed gratitude to the Government for its cooperation and outlined the importance of the Fixed Based Operation (FBO) building that will be erected shortly, which forms an integral part of SXM’s Capital Improvement Program. The program is funded by the loan secured when the company successfully floated a bond issue on the international financial market at the end of 2012.